The entire community is invited to this Passover Seder to strengthen positive relationships between the Jewish community and all who are dedicated to justice, diversity and respect. There is no cost to attend, but preregistration is required. 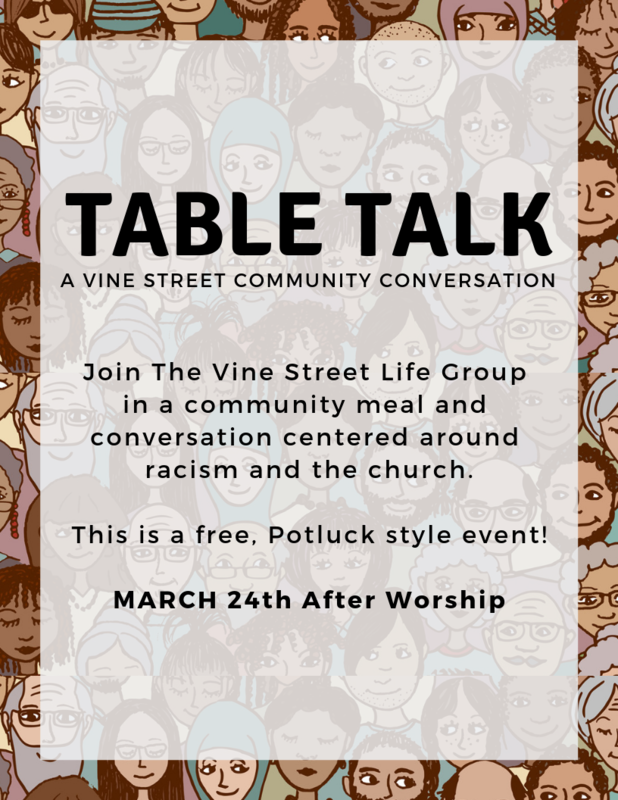 On Sunday, March 24, for about two hours after worship, the Vine Street Life Group is hosting a community meal in order to include the entire Vine Street community in topics around race and the church that they have been exploring for the last five months. During the first hour, you will be given a colored paper to determine your seating arrangements, then grab your food. Parents can help children decide if they would like to sit with them or at another table. At your table, while you eat, you will delve into questions ranging from how you have seen racism at work to how the church can be actively involved in combating racism. In the second hour, we will share some of our conversations with the full group to hear similarities and differences in experiences. This event is all age-friendly, but childcare will be available as well. There will be a variety of displays to help guide your thinking in this conversation. We do ask that you sign up, so we have a better idea of how much soup and chili we need to prepare. We also ask for you to bring a side, dessert, or drinks to go along with the meal. We are incredibly excited to share in a meal and conversation, bringing our table of unity into reality. Come join us on Sunday for the Festival of Cakes! It will be fun and delicious, and your love of carbs will support our middle schoolers’ trip to St. Louis this summer. Thank you! The season of Lent, a time of fasting, prayer, and repentance, begins with Ash Wednesday. Many of us appreciate the opportunity to come together on that first day for a time of prayer. We let ourselves be marked with the sign of the cross, a stark symbol of how profoundly fractured our relationships are with God, with one another, and with our fellow creatures. Yet at the same time, it is the emblem of our hope. The ashes are what is left of the palm branches we waved with joy and expectation when Jesus entered the city. Enthusiasm, commitments, and intentions gone up in flames. We are earthlings after all, creatures, not lords of creation. But our God remembers that we are dust (Psalm 103:14). This is our hope: the memory and boundless love of God. Come and join us on Wednesday, March 6,at 6:30 p.m. Going once! Going twice! Sold to the generous person helping our youth go to St. Louis! We are talking about cakes. Bring your favorite cake and bring your generous spirit to this year’s Festival of Cakes on Sunday, March 3, featuring a Mardi Gras theme, good food, yummy desserts, and a great cause—supporting our youths’ faith formation! Vine Street at the Movies, our monthly film group, meets on Wednesday, February 6, at 7:00 p.m. in the Bride’s Room to watch Ocean’s 8. Continuing a different kind of “me too” trend that started with 2016’s very successful Ghostbusters, a team of talented women hatches a devious plan to relieve a real cad of some priceless stuff. Mark your calendars for President’s day weekend, February 15-18, for our winter retreat in beautiful western North Carolina. There will be opportunities to enjoy games, the outdoors, a warm fire and conversations, and the city of Asheville. We’ll honor older traditions like a trip to a local coffee shop and pizza parlor, and maybe even plant seeds for new traditions to grow! The Souper Bowl of Caring is a movement founded by a church youth group in 1990 that aims to inspire others to collect dollars and food in the weeks leading up to the Super Bowl. Teaming up with local partners, groups around the country give 100% of donations to local charities, changing the nation's largest weekend of football into the largest weekend of caring. The Week of Prayer for Christian Unity is an annual event in response to Jesus’ prayer for his disciples that “they may be one so that the world may believe” (John 17:21). Traditionally the week of prayer is celebrated between January 18-25, between the feasts of St. Peter and St. Paul. Coordinated by the Pontifical Council for Christian Unity and the Commission on Faith and Order of the World Council of Churches, congregations and parishes all over the world arrange special ecumenical celebrations and prayer services. On Sunday we celebrate Jesus’ baptism in the Jordan river, the event that marks the beginning of his ministry. 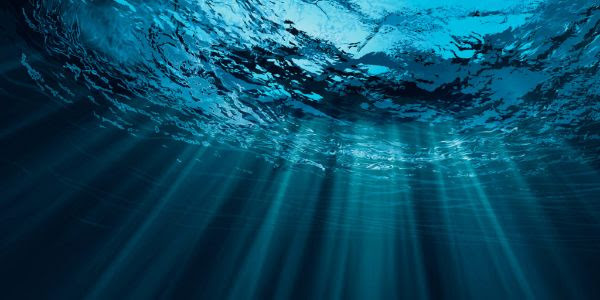 In the coming weeks, we will invite youth and adults who have not been baptized to explore their own faith in a small group setting and discern whether or not they want to be baptized. In the Disciples tradition, baptism is often practiced during the early teenage years, but we encourage this discernment process as a significant part of our faith formation and discipleship for believers of all ages, as well as those who were baptized as infants. Please talk to Allison or Thomas if you have any questions about this, be it for yourself or your child. The small group will meet during Lent, and we will baptize new disciples in worship on Easter Sunday, April 21. Ashley Halstead is pursuing a new career opportunity and will no longer be able to serve on our nursery staff. Sunday will be her last day in the nursery. We thank Ashley for her work with our children and wish her the best in her new endeavor! Until we hire a new staff member, we will need some nursery volunteers to assist Mina with childcare during worship (10am-11:15am). If you would like to volunteer, please contact Katie McLaughlin with your availability. Our Ministry Council will meet on Monday, January 14, at 6:30 p.m. in Fellowship Hall. This monthly event allows our leaders to plan and coordinate current ministry projects; in addition, significant time is set aside at each gathering for in-depth discussion of a single area of ministry. At our January meeting, we will discuss our community ministries, a.k.a. local outreach. Ministry Council meetings are open forums, and we not only allow, but encourage, participation by all congregants. What do you as children and youth want to learn in the coming year? What do you want to do, see, and/or experience? In 3-5 years, at its best, what will our children’s “program” look like? How might children and youth be part of Vine Street’s life and ministry? What might be meaningful faith formation activities for children and youth from your perspective as parents and grandparents? The answers and possibilities generated in this conversation will directly shape activities and faith formation opportunities at Vine Street in the year ahead. Kalie’s Life Group starts back on Sunday, January 13, 1pm-3pm, and will meet each Sunday until April. They will be reading the acclaimed The Hate U Give (read a sample) as well as planning events for a congregational conversation in a couple of months. The group deals with contemporary issues and how the church should be involved in those issues. Please email Kalie if you are interested in joining. They would love to have you! We invite members, friends, and neighbors to celebrate the birth of Christ with us! On December 24, we will gather for worship at 4:30 p.m. and again at 11:00 p.m. The 4:30 service is intergenerational, interactive (including a no-rehearsal nativity tableau! ), rich in stories and songs, and designed with young children in mind. The 11:00 service is Vine Street’s take on the Lessons & Carols tradition and includes communion. We invite members, friends, and neighbors to celebrate the birth of Christ with us! On December 24, we gather for worship at 4:30 p.m. and again at 11:00 p.m.
We hope you will join us at 4:30 p.m. on Sunday in Fellowship Hall, when the Children’s Choir will present their Christmas musical, Out Standing In Their Fields. After the show we will share a BBQ supper. There’s no charge, but the kids hope you will bring diapers—any size, any brand. To learn more about the need for diapers in our community, visit www.nashvillediaperconnection.org.